What’s better than iced coffee from Dunkin’ Donuts? 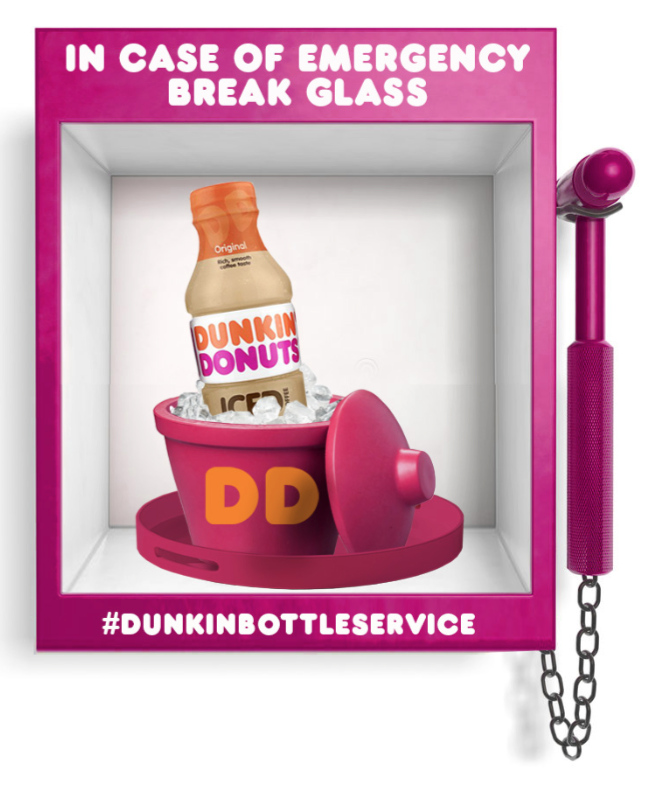 Free iced coffee from Dunkin’ Donuts, obviously — and now, it’s available with the push of a button. On June 21st, Dunkin’ is giving away iced coffee…as long as you’re in New York City, that is. Here’s how it works: All you have to do is show up to one of the participating locations and find the “glowing beacon.” Then, press the button and a waiter will appear with a bottle of iced coffee in a metal ice bucket. The company is calling it their version of “bottle service,” and we’re into it. According to the Dunkin’ Donuts website, you can get your free coffee at two “high-traffic” locations: 6th Ave. between 42nd and 43rd, and Union Square East and E. 16th Street. But if you don’t live in N.Y.C., all is not lost — you can also fill out a form on Dunkin’s website and they’ll mail you a coupon for a free bottled iced coffee so you can try it out yourself. This promotion is important for another reason, too: Thursday is the longest day of the year — the Summer Solstice — which means you’re probably going to need coffee even more than usual. Not having to pay for it? Just icing on the cake. Or in this case, the donut. Which you should totally get if you stop by a Dunkin’ today, because donuts are delicious. Grab your iced coffee — or your coupon to get free coffee another day — and find something fun to do with your extra time before the sun sets today. Or, you know, just go to bed early. Catching up on sleep is the best.